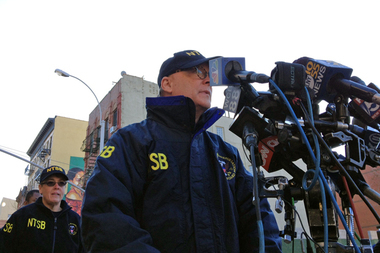 National Transportation Safety Board board member Robert Sumwalt outlines the investigation into the Park Avenue building explosion during a press conference in East Harlem March 13, 2014. MANHATTAN — The National Transportation Safety Board has completed its investigative work at the site where two Harlem buildings exploded earlier this month, killing eight people, the agency said Monday. The NTSB will now finish its analysis at the federal agency's Washington, D.C. headquarters. The team collected sections of the 8-inch gas pipe that ran below Park Avenue, which was found to be leaky in tests conducted at the site following the fatal explosion. Investigators will also examine service pipes connecting the gas main to the leveled buildings, at 1644 and 1646 Park Ave., and segments of a 12-inch water main, which contained a large crack, according to the agency. The NTSB was able to collect only a few of the smaller feeder pipes that connected the main to the buildings, according to a preliminary report. Those pipes passed a pressure test performed at the site. The March 12 explosion, which left eight people dead and dozens injured, sent debris flying onto the nearby Metro-North tracks, damaged surrounding buildings and displaced many surrounding residents from their homes. In addition to public transportation accidents, the NTSB is also charged with investigating pipeline explosions. The NTSB will post updates on its website as the investigation continues.